Sanjay Aggarwal was paid total remuneration of Rs 3.99 crore for 2012-13, largely unchanged from about Rs 4.01 crore in the previous year. 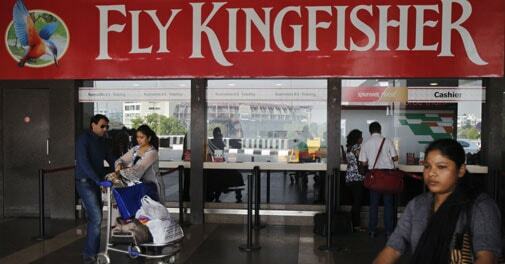 Kingfisher Airlines may be grounded for almost an year now but the cash-strapped carrier has given its CEO Sanjay Aggarwal a pay package of nearly Rs 4 crore for the last financial year, during which its headcount nearly halved to 2,851 employees. Aggarwal was paid total remuneration of Rs 3.99 crore for 2012-13, largely unchanged from about Rs 4.01 crore in the previous year. This "excludes accrued leave encashment and gratuity since the same have been recognised for the company as a whole and cannot be determined at an employee level," Kingfisher said about Aggarwal's pay package in its latest annual report. Besides, Aggarwal is also "entitled to free use of the company car and telephone", said the Annual Report which is being circulated to Kingfisher Airlines' shareholders ahead of its Annual General Meeting on September 24. Aggarwal was earlier CEO of low-cost airline Spicejet and there have been persistent rumours about his exit from Kingfisher ever since the airline venture of Vijya Mallya-led UB Group had to ground its operations in October last year. The company has disclosed that at least five of its employees got an annual pay package of Rs 1 crore or more in the last financial year, while as many as 44 staff members got a monthly salary of Rs 5 lakh and more. In comparison, the company's overall employee expenses fell sharply by 48 per cent to Rs 349 crore in the financial year ended March 31, 2013, largely on account of a sharp decline in its total number of employees from 5,696 to 2,851. The staff costs included Rs 7.2 crore as gratuity payment to the employees who resigned during the year. However, an amount of Rs 4.1 crore as gratuity to resigned employees (relating to financial year years 2011-12 and 2012-13) remained outstanding for a period of more than six months from their payable dates. Kingfisher, which blamed employees' refusal to coming to work as a key reason for grounding of its operations, however, said it still has an "appropriate staff on its payroll" to restart its operations. "Your company still has appropriate staff on its payroll. These include the senior and mid level managers and sufficient number of pilots, engineers, dispatchers to operate up to 20 aircraft. Additional staff can be hired as the airline business ramps up," the company said. Kingfisher Airlines had accumulated losses of over Rs 16,000 crore as on March 31, 2013, while it had a negative net worth of close to Rs 13,000 crore. Its long-term borrowings stood at about Rs 6,900 crore, while short-term borrowings were Rs 1,750 crore at the end of last financial year. "The management is optimistic about recapitalisation and restart of the airline operations of your company. All efforts are directed towards a successful restart," Kingfisher said, adding it remains in talks with a potential investor. The company said its earlier dialogues with "several Asian carriers" for a potential investment could not fructify because of political uncertainty, as also lenders' hostile recovery actions and "constant negative media statements".